Dubai: For most cryptocurrency market investors, one question that stirs up both excitement and trepidation looms large: Could this be the start of a Bitcoin bull run? In a classic case of once bitten, twice shy, memories of December 2017 — when the cryptocurrency made stratospheric gains before coming down with a thunderous thud — come flooding back. Then, the digital asset hit a peak of $19,000 (Dh69,787), prompting many to jump in, before tumbling to settle around $7,000 in the space of just two months. And true to Warren Buffett’s age-old investing wisdom — “It’s only when the tide goes out that you learn who’s been swimming naked,” — many were caught flat-footed and more terribly singed. 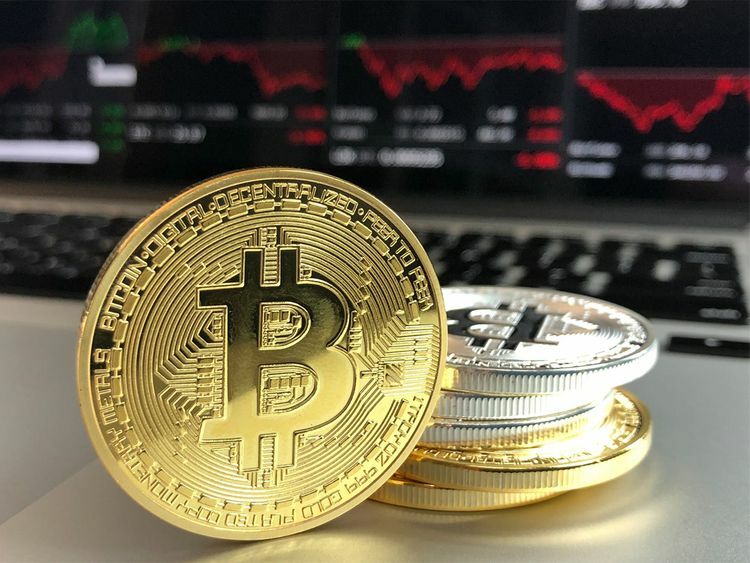 Which is why caution is the keyword this time around, especially after Bitcoin, which was trading around the $4,000 mark, sprang back to life on Tuesday, sounding the horn of opportunity and riches galore to both investors and fence-sitters. This was after a major order by an anonymous buyer set off a frenzy of computer-driven trading, pushing up prices. The order worth about $100 million was spread across US-based exchanges Coinbase and Kraken and Luxembourg’s Bitstamp. Eager not to be caught on the wrong side of the fence, wary investors did not rush to place new positions after the digital asset gain $700 in just one day. 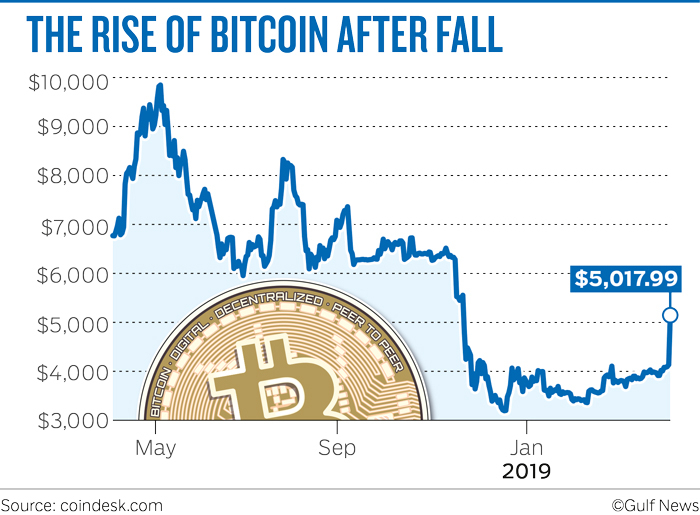 With the rally continuing, Bitcoin traded at $5,017.99, up 4 per cent on Wednesday, fuelling market speculation as to whether this was the big wave they had been waiting for, the one that would drive a recovery in prices. But some analysts are not that bullish. I wouldn’t say that this is a revival. This is a technical rally... There is a volume gap at $5,000 level and the market is waiting for that. There is a stark difference in the way Bitcoin prices have behaved this time around. The earlier run that was seen in 2017 was parabolic, with Bitcoin’s value jumping 500 per cent from September to December to top $19,000. This time around, the pace of gains seems to have slowed. Prices have only risen by 20 per cent over the last two sessions. I will have to wait more to buy Bitcoin. There is more risk now. It will take more time to consolidate. For Jacob S. Pouncey, a cryptocurrency analyst at Saxo Bank, the market reacted to a coordinated buy order across several exchanges. “The order was about $100 million in value. The fundamentals of the crypto ecosystem has been growing,” Pouncey told Gulf News. I’m holding on to my cryptocurrencies. I’m still in a good amount of profit, and I expect positive growth this year. There has been talk of concerted efforts by so-called ‘mystery traders’, highlighting the vulnerability of the market. “This is a fully unregulated market, and that leads to loads of uncertainty,” Jibrel’s Tabba said. Trouble could come at $5,200, which has been a support level, Fawad Razaqzada, a market analyst at Forex.com, said. “We will be monitoring BTC/USD prices for further developments over the coming days to figure out whether this was indeed a genuine breakout or another false hope for crypto bulls, [which] have witnessed many such price spikes after the bubble deflated violently at the back end of 2017 only for the selling to quickly resume again,” Razaqzada said.